Welcome to our posting board! Our clients can use this board to list for sale and wanted ads, as well as posts for lost pets. All posts will be reviewed by staff prior to appearing on the posting board. Click here to upload your post. Big thanks to Dr. Sherman and Brandy for coming out to our home to take care of all of our fur babies needs. You have the best customer service and professionalism of any Animal Hospital I have ever taken my babies to. Pinky is looking for a loving home. He is one of the most loving cats you will ever set your hands on. He is about 8 years old and he was neutered as a young kitten when adopted. He does not scratch or bite. He is current on all of his shots. The only reason he is looking for a new home is because my mom passed away from cancer. He has always been an indoor cat and loves everyone that wants to give him attention. He always uses his litter box. We already have two female cats in our house so we cannot keep him. If you want a cat who loves attention, Pinky is the one for you. See his photo attached. Please call Sue at (210) 792-7600 if you are interested. 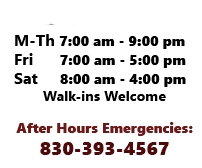 Veterinarians serving Floresville, Karnes City, Pleasanton, Kenedy, San Antonio, Poteet, Beeville, Texas and surrounding areas.